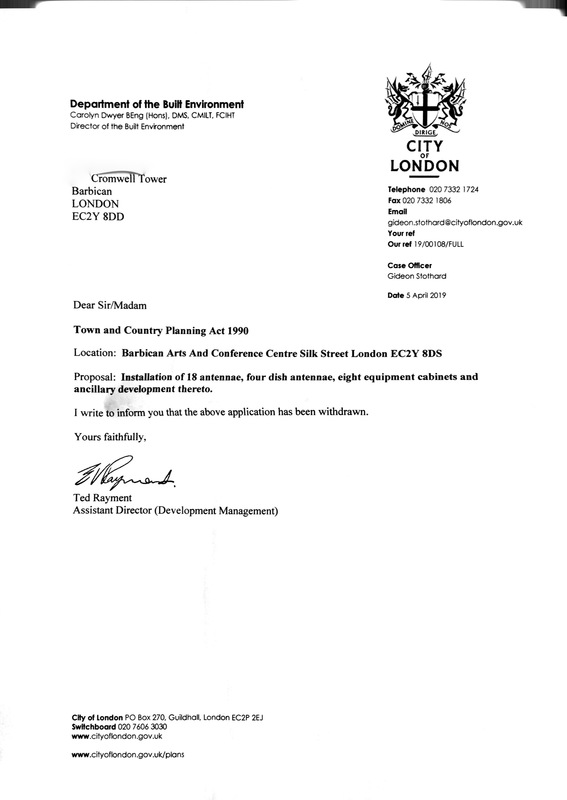 In March 2019 the Barbican Association alerted our Chairman that there was a Planning Application to put aerials on the fly tower of the Barbican Arts Centre. Picture by Barbican resident to show location of aerials. View from Silk Street. There were approximately 180 objections to the application, including one made by the Barbican Arts Centre, submitted by Jonathon Poyner, their Buildings manager. I am writing on behalf of the Barbican Arts Centre and Guildhall School where I am the Director of Buildings and Operations. We wish to object in the strongest possible terms to the above application. We note that this is a Grade II* Listed Landscape and Conservation area, lack of pre-application consultation, impact on health and customer amenity and health and safety aspects including access plus potential interruption to our business. 1. Damage to Listed Landscape. The Fly Tower and its associated Conservatory form an important aspect of the Barbican and the environment that is created for our residents and customers. Given the alternative sites within the area, which are also higher, we believe that this proposal is inappropriate. Visual impact of the Fly Tower and Conservatory would be impacted upon, not least for those higher than us who look down on what is London’s second largest covered glass area of its type. The area would require access to fit and maintain the equipment and this would not only have risks to the Tower and Conservatory whilst we are operational, but any subsequent maintenance and/or site visit due to breakdowns etc. could impact on our business as we are invariably a ‘live venue’. Should we have people working at height in the area of or above the Conservatory, we are concerned of the impact this would have on any events or staff in the Conservatory. Likewise the impact of the equipment on any equipment (e.g. filming etc.) in the Conservatory and in the Hall and Theatre is unknown. We are not aware of any consultation from the applicant to the Barbican or School. Please advise if we are wrong in this position. The application was withdrawn on 5th April 2019. Here is the letter confirming the withdrawal. Click to expand the letter.